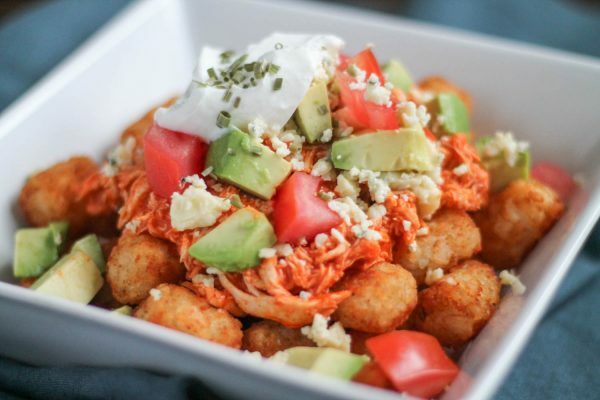 Let’s combine two of my favorite things: buffalo chicken and tater tots! 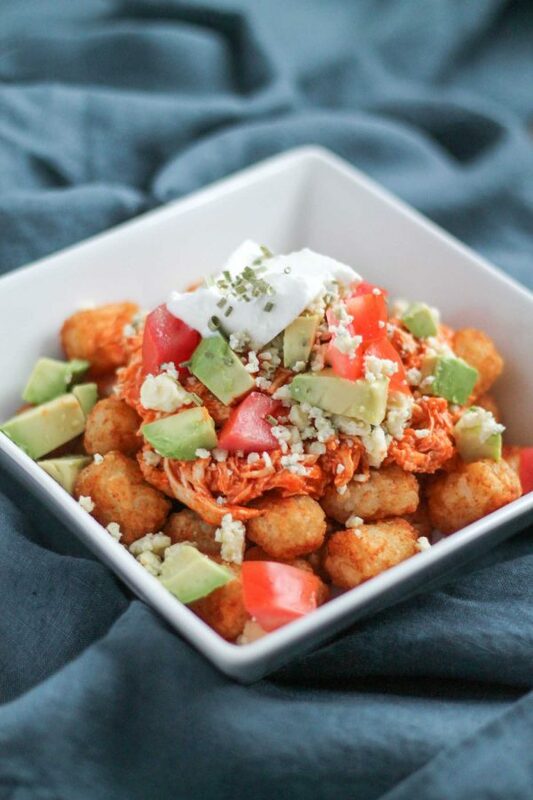 These Buffalo Chicken Totchos are a quick, easy, and satisfying snack. 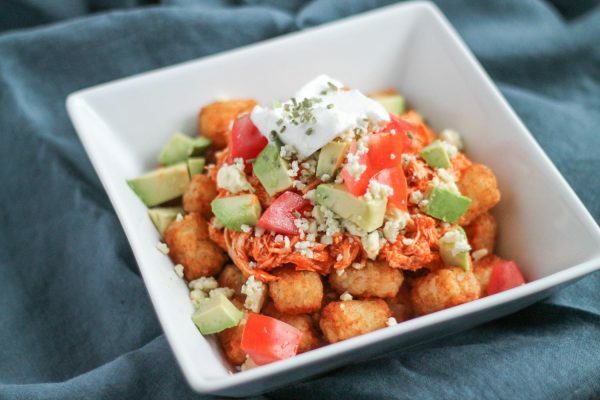 Crispy tater tots are topped with chicken drowned in spicy buffalo sauce and topped with blue cheese, avocado, tomatoes, and sour cream. It’s the ultimate combination of spicy and cheesy flavors paired with crunchy potato goodness. 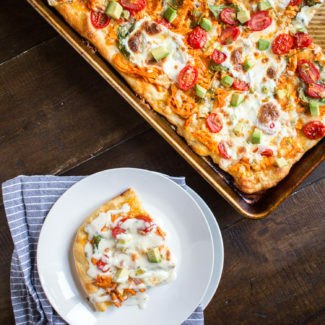 It’s the ideal food to pair with a lazy afternoon of watching movies and something fun to serve at sports viewing party. 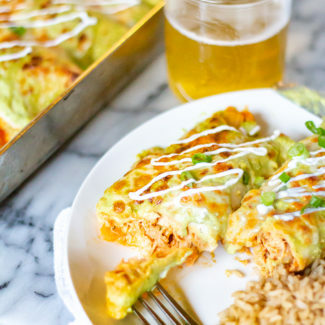 This is a fun recipe to make with leftover chicken, just shred it and add buffalo sauce to taste. If you don’t have leftover chicken, just buy a rotisserie chicken from the grocery store. 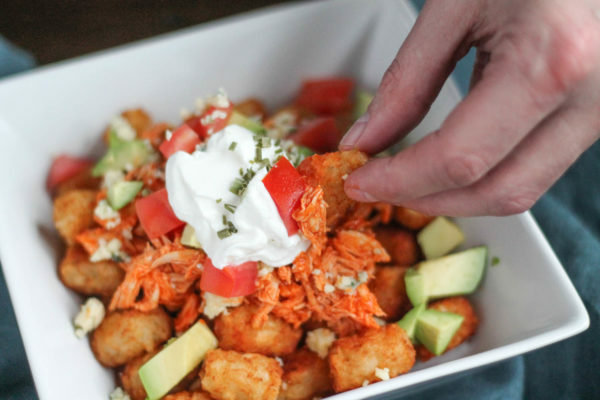 Heat the buffalo seasoned chicken up, layer it on top of cooked tater tots, and add your toppings. 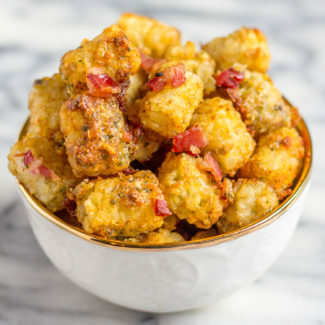 The only cooking involved is baking frozen tater tots and reheating chicken, this is a foolproof recipe, and it only takes about 30 minutes from start to finish. I think you could transform this snack into breakfast by simply adding a sunny side up egg on top. Doesn’t that sound incredible? Other ways to mix up this recipe include adding bacon, jalapenos, or roasted bell peppers. 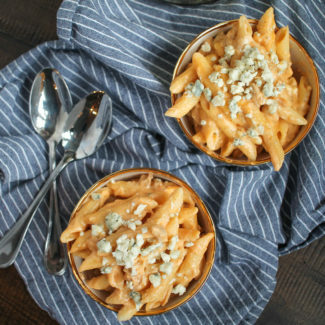 You could even swap out the blue cheese for blue cheese or ranch dressing. 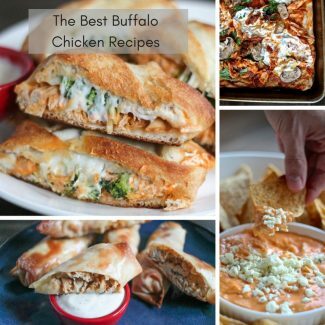 It is easy to control the spice level of this recipe, by adding as much buffalo sauce as you want. I love it, so I added about 1/2 cup of the sauce, but you can add more or less to taste. You could even use half barbecue sauce and have buffalo sauce if you want. Interested in trying another “totcho” recipe? 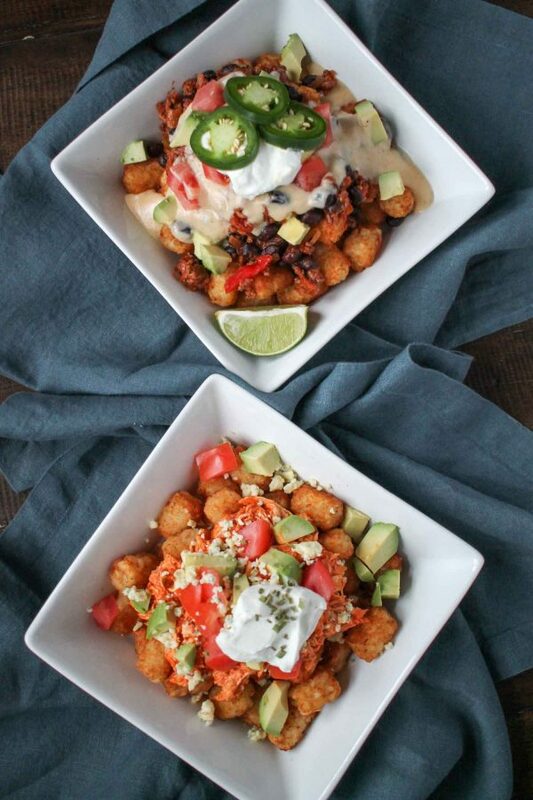 Try this recipe for Chili Cheese Totchos! It’s the same concept with a completely different flavor. 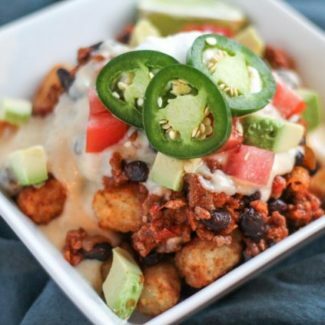 Tater Tots are topped with a simple beef chili, a cheddar cheese sauce, tomatoes, avocado, and jalapenos. While the tots are cooking, shred the chicken and add the buffalo sauce to taste. I added about 1/2 cup. Then dice the avocado and tomato. Once the tater tots are ready, heat up the chicken in the microwave. 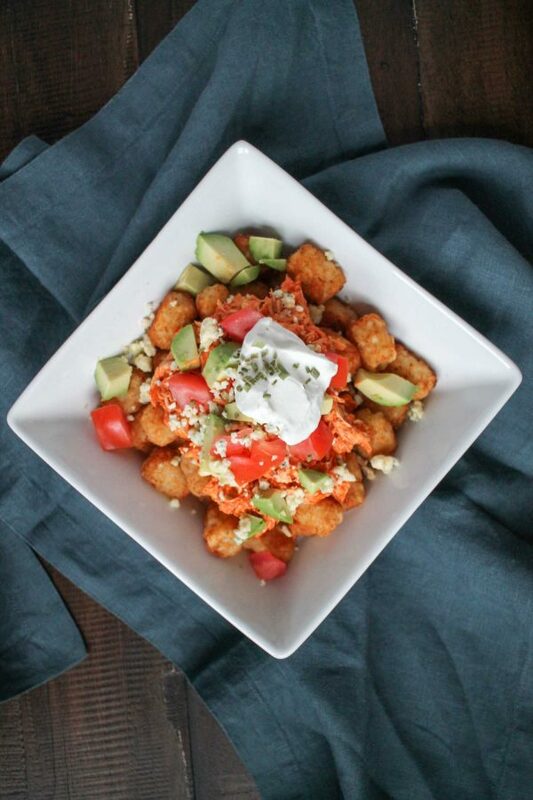 Arrange the tater tots in a shallow bowl and top with the chicken, blue cheese, avocado, tomato, and sour cream. Serve immediately.